This is truly the land of “30,000 islands” but also the land of big water. Most cruisers like us tend to stay in the small craft channel as much as possible as it ensures both beautiful scenery and protection from the weather. The channel is very well marked (thank you, Canadian Coast Guard) and meanders through the thousands of islands comprising the coastline of the bay. Some islands are large, others are tiny; many are lush and green, others are rocky with a few scrappy pines; most have one or more cottages tucked into the green space or perched on bare rock. All are mostly granite. Cottagers who own property here have found a way to make the most of the landscape and surrounding water by building elaborate dock systems, boat houses, decks, swim platforms and, in some cases, clusters of cottages that clearly accommodate extended family with places to spend time together as well as apart. But the way they’ve done so makes it feel as if they’re a natural part of the landscape. It’s common to see kids cruising the waterways in small boats the way kids on dry land ride their bikes in their own neighborhoods. Living or vacationing here is definitely a way of life, and we feel privileged to share it for a moment or two. Winter must be a bear, however (no, we haven't seen any actual bears yet ...). So far our experience of Georgian Bay has been very different from our journey leading here. The Rideau and Trent waterways, all generally leading in one direction, have been replaced with open-ended opportunities that are best explored with some good planning balanced by a flexible spirit. We’ve always been good at planning. It’s the flexible part we’re still working on. Our first challenge arose during our night at anchor off Beausoleil Island. The Captain noticed a significant dip in our battery capacity, something that could create real problems if not addressed. Due to the complexity of our boat, our power needs are quite high. We generate power when the engine is running (while cruising), when we run the generator (which generates some diesel fumes and noise) and through solar generation. All of that energy gets stored in a huge battery bank and converted as needed to meet the power demands of the boat. If it can’t be stored properly, we are dead in the water – pun sort of intended. We decided to cruise to our next anchorage, Sandy Bay off Hope Island, and monitor the batteries a second night. Sandy Bay did not disappoint. The name says it all. The water there is so clean and clear, you can see the bottom 20+ feet down. We enjoyed a wonderful late day swim, and the Captain took advantage of the clear water to inspect parts of the boat that are usually hidden underwater. This is really what the water looks like! The batteries did disappoint, however. So we modified our plans and returned to Queen’s Cove marina for a couple of nights. We ran some tests, made some adjustments, crossed our fingers and resumed our trip. We next cruised to an anchorage in Port Rawson Bay by way of Henry’s Fish Restaurant. Henry’s, located on Fryingpan Island, has achieved some level of fame for its Great Lakes fish dinners and is generally considered a stop not to be missed. While we enjoyed the stop, it felt more touristy than we’d expected. On the other hand, Port Rawson Bay blew us away. It was there that we unwittingly gunkholed for the first time. Now, let me explain. According to Wikipedia, “gunkholing” is a boating term that describes cruising in shallow water, meandering from place to place and spending nights in coves. And that’s what we did. We followed a narrow channel and found the perfect, most beautiful secluded cove to tuck into and drop our anchor. We did our meandering by dinghy. While at anchor the silence was broken only by a few bullfrongs (of course), a curious hummingbird who was persistent in his attempts to check out the potted geraniums I have growing in the cockpit and a monster dragonfly who scared me half to death when he landed on our boat to devour his equally monstrous prey. For scale, the fastener part at the lower left is almost as large as a quarter. The good news is, these monsters eat horseflies and deer flies, both of whom like to prey on humans. The following video's a little long, but it was too fun not to include. In one of those nooks we encountered a family of loons – Mom, Dad and Baby. I’ve always been enamored with loons, so we shut down our motor to observe for a few moments and were able to capture an up close and personal video of a loon’s call. I am truly ashamed to say that it wasn’t until the end of the video that I realized we had gotten too close to their territory and Dad, who was a very large and healthy loon with menacing red eyes, was making it known that we needed to leave … immediately. I pride myself on my deep respect for wildlife and felt a little guilty to have intruded as we did. Nevertheless, it was a really neat experience and a rare opportunity to observe loon behavior. Dad very effectively separated us from Mom and Baby and cleared us out of their territory. From there we’ve continued to tie up in some locations and anchor in others, keeping our eyes on the batteries. We tied to the city wall for a night at Parry Sound (which we didn’t love), gunkholed off Black Bass Island near Hopewell Bay (which we enjoyed quite a bit) and spent the last two nights docked at Wright’s Marina in Byng Inlet. The pictures below were taken during a dinghy ride through "The Hole in the Wall" near our Black Bass anchorage. This morning we set off bright and early on the next leg of our trip. We are flexing once again, as there are many forest fires raging in Ontario due to the hot and dry weather, including a huge fire just northwest of us, the direction we’re headed. The local authorities have restricted travel across a large area. 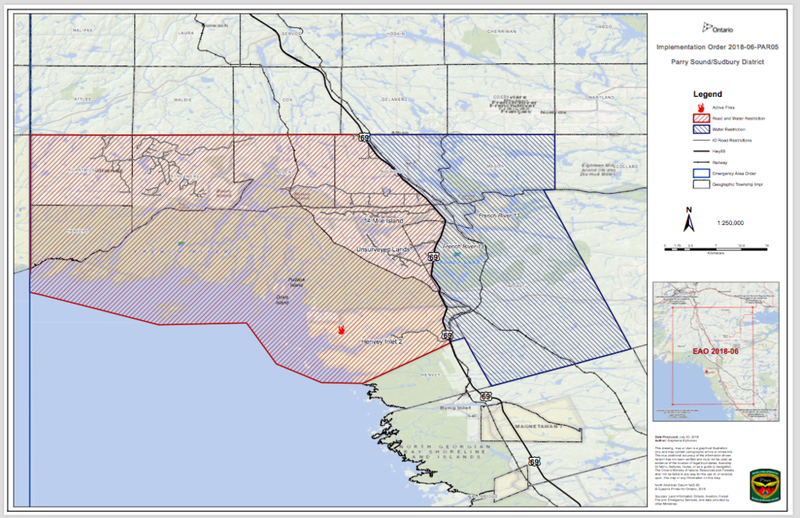 The map below shows the restricted area resulting from the “Parry 33” fire. You can see our most recent location, Byng Inlet, near the bottom right hand corner of the map. We are traveling this morning across the “big water,” and I’ve included a video that shows the huge wall of smoke off our starboard side. We’ll continue to flex as we go. And we’ll join the locals who are collectively holding their breath and praying for rain.